Solid materials are regularly characterised relative to their density, which is expressed as the mass of a powder or solid material per unit volume. Density measurements are regularly acquired using a form of gas displacement, which can rapidly determine the real density and purity of solid materials such as ceramics, metals, and polymers. The Thermo Scientific Pycnomatic is a comprehensive solution for performing density measurements of solid materials. It features a fully-integrated, high-precision temperature control for exceptional results reproducibility. It boasts a real multi-volume capability for utmost accuracy of results with different solid materials, including fine powders and foams. Absolute density of solids and powders is commonly measured through pycnometry, which uses gas displacement to determine the particulate density and purity of compact and granulated solid samples. This method uses a test gas with minute atomic dimensions such as helium to permeate the porous structures of a dry powder or solid sample. The small atomic size of helium enables the test gas to diffuse through extremely narrow pores, providing a volumetric measurement that can be compared to the weight of the dried sample to characterise the real or absolute density of the sample. 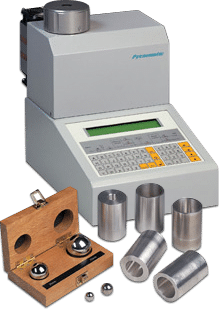 Meritics supplies the Thermo Scientific Pycnomatic for gas displacement measurements of solid and powdered samples in a range of industrial and commercial fields. Ceramics, geological samples, pharmaceutical products, building materials, and more can be characterised with unrivalled reproducibility results for research and development and quality control in critical applications. Contact us for a quote or to discuss your density analysis needs.